In 1990, despite resistance from the business sector and state and local governments, disability groups and activists, together with responsive government leaders, succeeded in passing the most significant civil rights bill in decades. 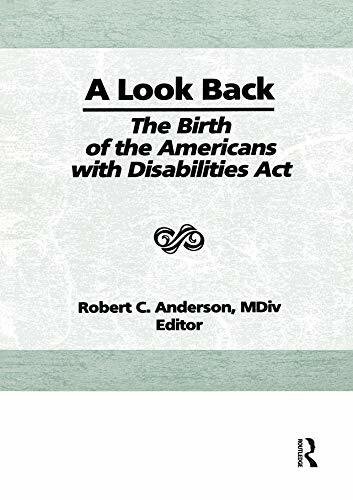 A Look Back: The Birth of the Americans with Disabilities Act takes you to the unique moment in American history when persons of many different backgrounds and with different disabilities united to press Congress for full recognition and protection of their rights as American citizens. The ADA recalls the promise of earlier civil rights legislation and advocacy. A Look Back will remind you that people are people before they are disabled and that they deserve to be acknowledged as individuals, rather than stereotyped on the basis of their physical conditions. You’ll witness this firsthand through the inspirational example the Reverend Harold Wilke has set through his own personal struggles, triumphs, and ministry. A witness to the signing of the ADA on the lawn of the White House, he played a key role as a vocal activist in the transformation of self-image for persons with disabilities and in the fight for this bill. In this book, you will see the progress that has been made since the ADA was passed and that, despite the headway made for empowering persons with disabilities, there is much to be done before all individuals are aware of their rights, responsibilities, and protection under the ADA. A Look Back contends that through public education, pastoral care, and open, sensitive congregations, bridges can be built between religion, secular society, and persons with disabilities. This will result in persons with disabilities becoming full participants in daily American life.